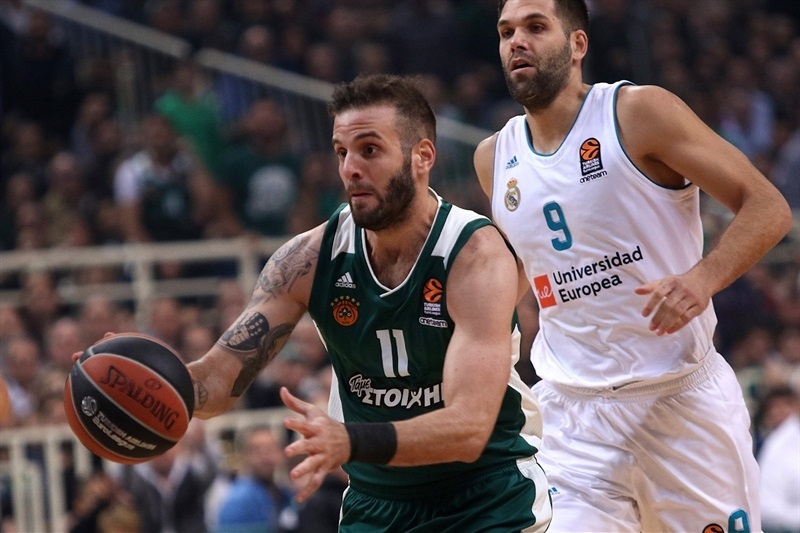 In an outstanding thriller that literally went down to the final shot, Panathinaikos Superfoods Athens rallied from a 16-point deficit in the final 19 minutes to top Real Madrid 82-80 in the Greek capital on Friday. 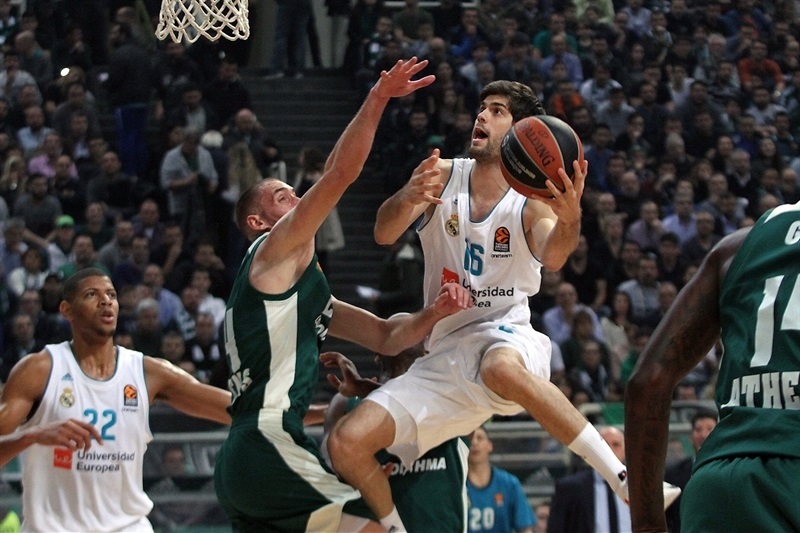 Panathinaikos improved to 6-3 and remained undefeated at home while Madrid dropped to 5-4. K.C. Rivers led the winners with 20 points. 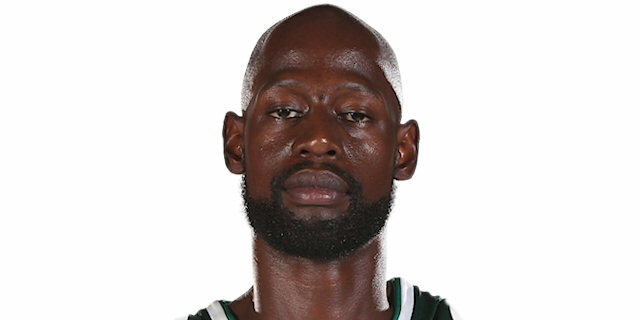 James Gist had 15, Nick Calathes added 12 and eight assists while Chris Singleton got 10 points for Panathinaikos. Luka Doncic led Real Madrid with 19 points. Felipe Reyes and Trey Thompkins each added 12 for the guests. Doncic had 10 points in the opening quarter, getting help from Fabien Causeur and Walter Tavares to give the guests a 23-28 lead after 10 minutes. A three-pointer by Chasson Randle made it a double-digit game, 23-33, early in the second quarter. 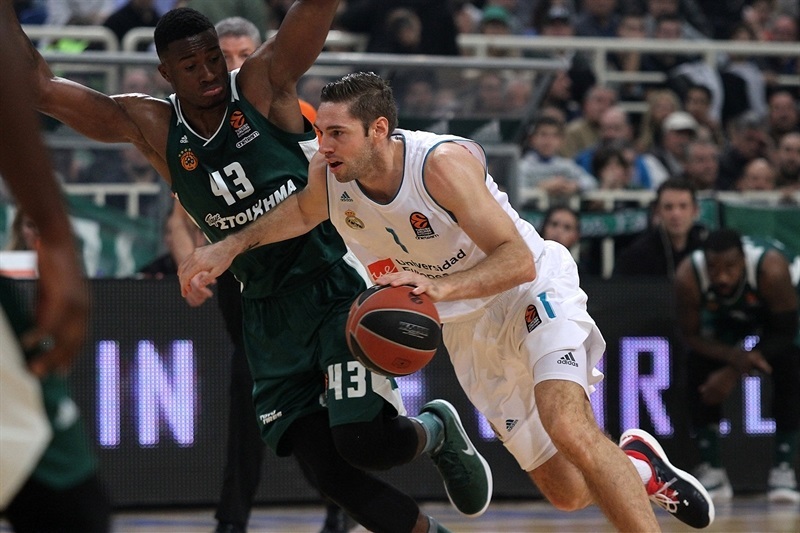 Trey Thompkins, Rudy Fernandez and Felipe Reyes stepped up to boost Madrid's margin to 40-56 right after the break. 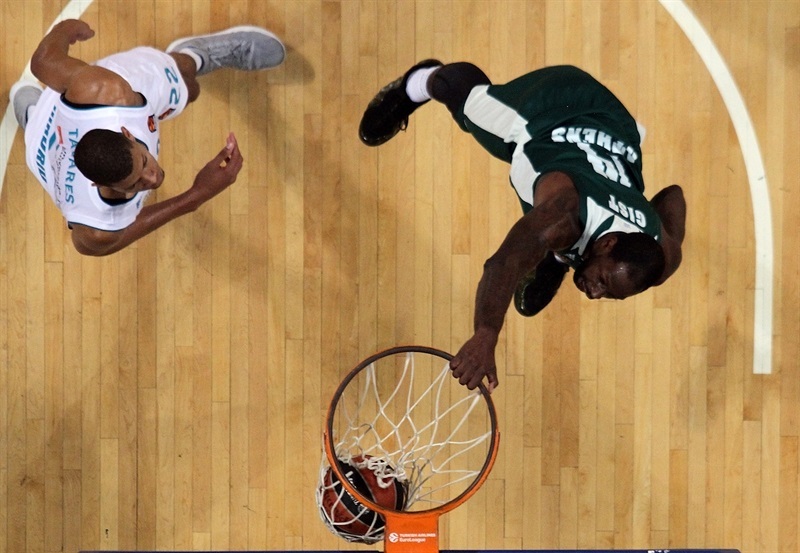 But Gist and Rivers fueled a 13-0 run that brought Panathinaikos back in the game. Singleton tied it at 62-62 but a three-pointer by Fernandez and a buzzer-beating jumper by Facu Campazzo restored a 64-69 Madrid lead after 30 minutes. A three-pointer by Rivers and a tip-in by Gist completed the hosts' comeback, 77-73. 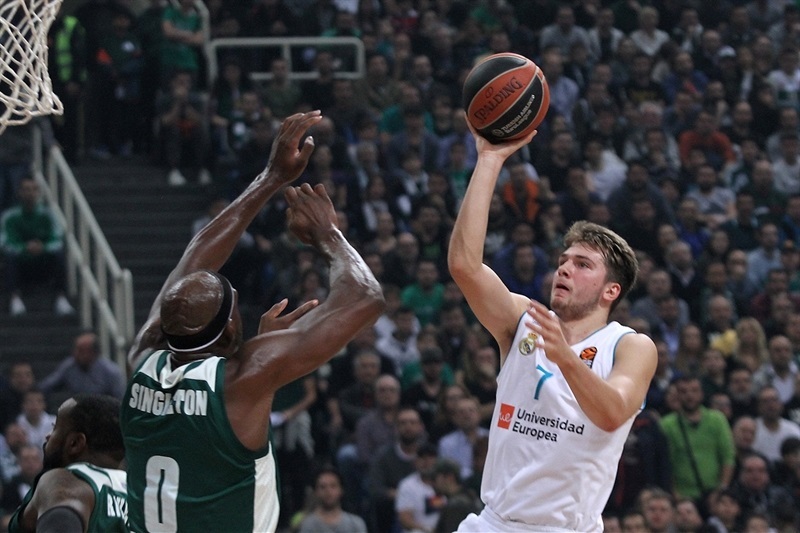 Doncic twice tied the game, but Gist drew a foul and was perfect from the line for an 82-80 lead with 15.5 seconds left, and Thompkins missed from downtown at the buzzer. 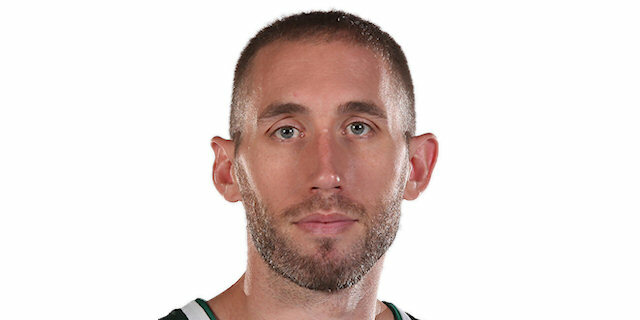 Matt Lojeski got Panathinaikos going with a fast break layup and a couple of three-point shots for an 8-2 lead. 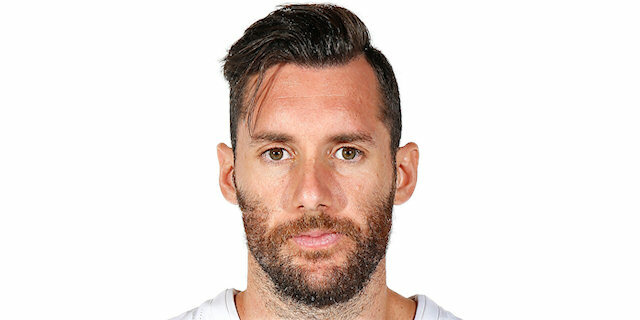 Gist took over with an alleyoop slam but Santiago Yusta stepped up with consecutive baskets, Causeur and Doncic each struck from downtown and Walter Tavares added a layup-plus-foul for an 11-15 Madrid lead. 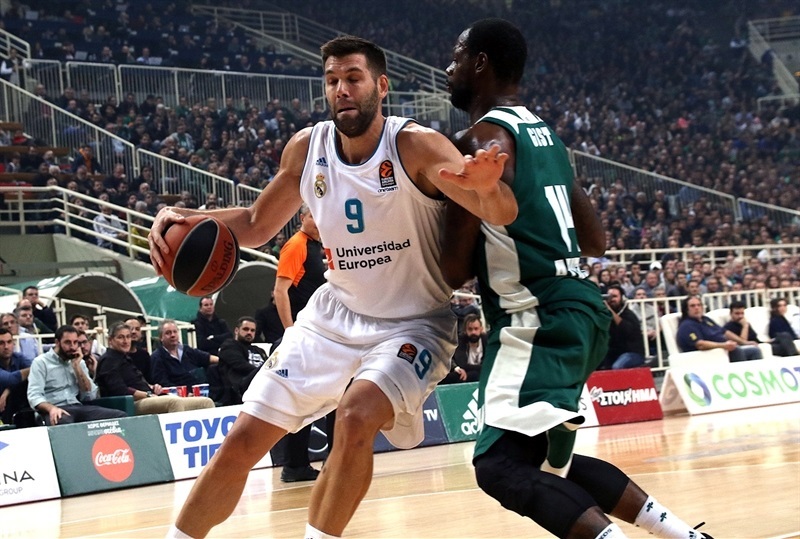 Thanassis Antetokounmpo and Gist rocked the rim but Doncic hit another triple, getting help from Causeur and Reyes to keep Madrid ahead, 19-24. Doncic followed a coast-to-coast layup with free throws but Ian Vougioukas and Rivers kept Panathinaikos within 23-28 after 10 minutes. A three-pointer by Randle made it a double-digit game, 23-33, early in the second quarter. Nikos Pappas tried to change things with consecutive driving layups and a pair of free throws but Thompkins and an unstoppable Reyes kept Madrid fully in charge, 33-41. Singleton followed a triple with foul shots but Fernandez and Thompkins quickly answered and a dunk by Tavares made it a 13-point game, 38-51. 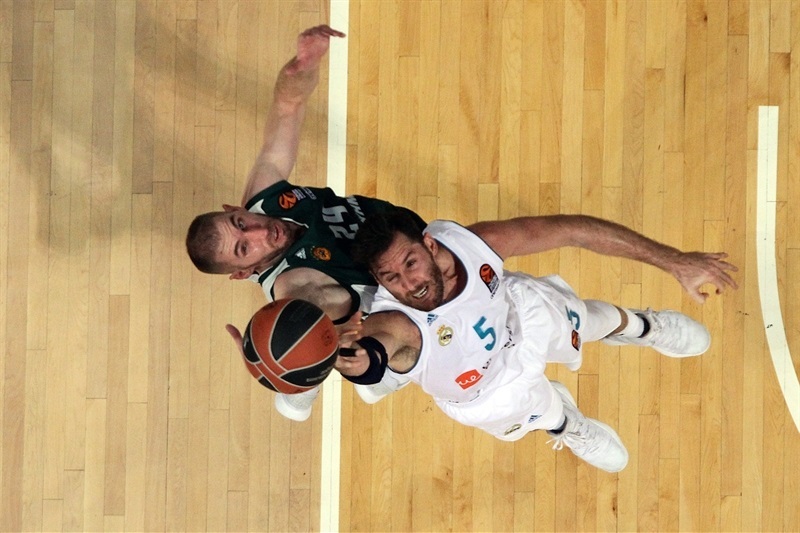 A layup by Calathes and a three-point play by Fernandez fixed the halftime score at 40-54. Campazzo shined with a backdoor layup soon after the break but Madrid would not score in the next four minutes. Meanwhile, Rivers and Gist combined for 11 points in an 13-0 run that brought the Greens within 53-56. Rivers struck from downtown and Singleton followed a triple with a jump hook to tie it at 62-62. Fernandez buried a three-pointer, Reyes added a layup and Campazzo beat the buzzer with a rainbow jumper to give Madrid fresh air, 64-69, after 30 minutes. 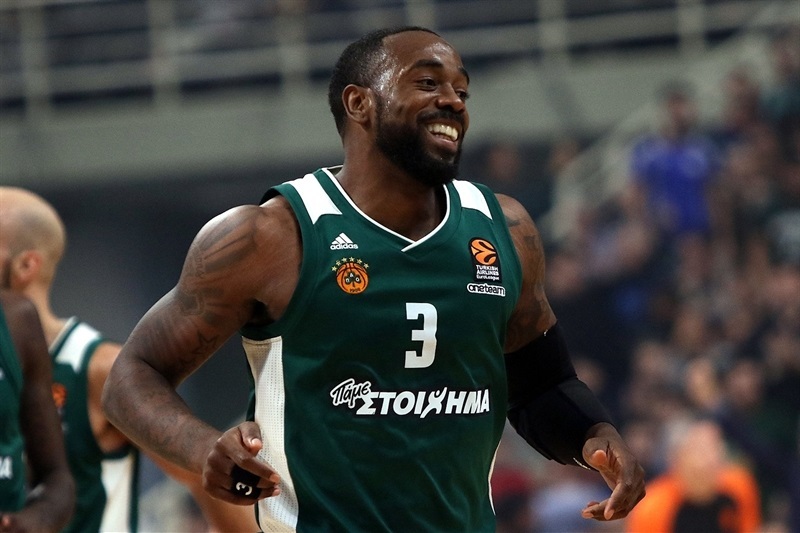 Rivers singlehandedly brought Panathinaikos within 69-71 early in the fourth quarter. 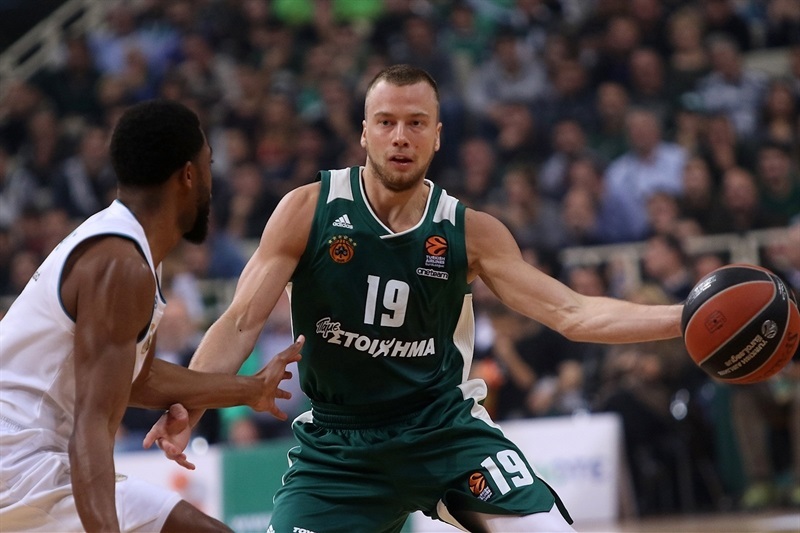 Thompkins hit free throws but Calathes had a fast break layup, Rivers hit a three-pointer and Gist added a tip-in in an 8-0 run that put the Greens in charge, 77-73, with under three minutes left. Doncic split free throws and added a wild triple that tied it at 77-77. Thompkins split foul shot and Pappas struck from downtown in transition for a 80-78 Panathinaikos lead with 22.5 seconds left. Doncic tied the game from the foul line but Madrid fouled on Gist, who put the hosts back ahead, 82-80, with 15.5 seconds left. Madrid had the chance to win at the buzzer but Thompkins missed from downtown. 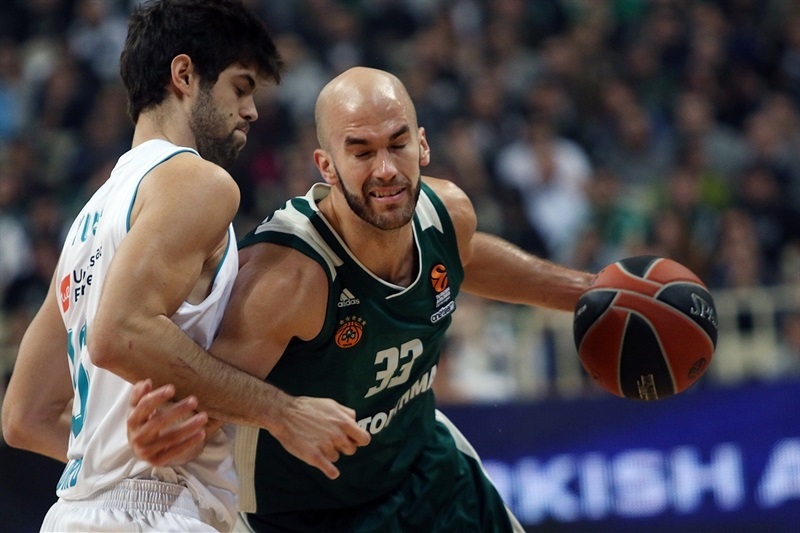 Both teams return to Turkish Airlines EuroLeague action on Friday - Madrid welcomes Crvena Zvezda mts Belgrade while Panathinaikos hosts Unicaja Malaga. "First of all, thank you very much to our fans who helped us in an incredible way. I think the story of the game is very clear. We couldn't find the way to play defense in the first 20 minutes. On one side, due to our mistakes and on the other hand, Madrid played excellent. Any small mistake was punished with a basket, because they have incredible quality. After halftime, we changed the way of the game. We started to feel the game on defense and kept control on offense. We passed the ball better and played better basketball, defense and offense. This is why we had chances to win in the end. When Madrid played zone, we didn't attack well twice in a row, but with two good defenses, we found a transition offense, scored a three-pointer and decided the game. We are very happy about these last 20 minutes but it is very clear that we cannot start the game like today. It is a win that gives us a lot of credit - beating Madrid when it leads by 14 is very difficult. We are a team that, if we are not organized on defense, we make a lot of mistakes on offense. Our worst minutes on defense in the second quarter were also our worst on offense. We didn't have the ball in a smart, effective way. This is a very satisfactory win because it was a big game and we could give it to our fans, which makes us feel very good. We know we will have a lot of close games in the EuroLeague. With a team like ours, which always tries to be in the game, it will happen a lot. Being able to play well in those situations is important. When Madrid switched to zone defense, we lacked determination on offense and that could have cost us the game. We can win or lose, but I always ask my players not to lose their determination in key moments. We have played four close games so far and won three of them. We have to try to be effective in the final minutes." 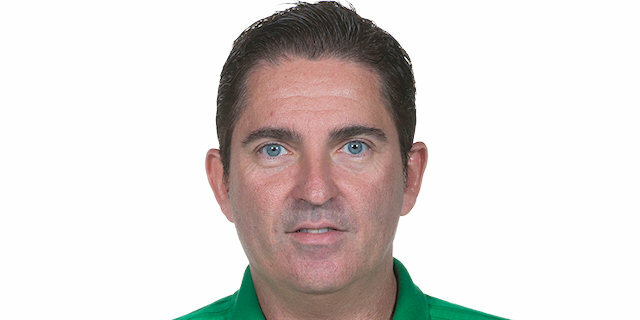 "First of all, congratulations to Panathinaikos for the victory. I think it was a very tough game from the beginning. We played very solid in the first two quarters, defensively and offensively. We controlled the rhythm of the game, which is how we got the big advantage. But in the second half, we lost a little bit of our energy. We had some stupid turnovers that made them get easy baskets. Then, at the end, on the final decisions, let's say we had an open three to win the game, so for me as coach, it is sad when you lose like this but I think we did a lot of good things during the game to stay on it. It is difficult (to have so many injured players). We are having a tough season with those situations. We have five players out - Kuzmic, Ayon, Randolph, Llull and Taylor. But I think that the strength of a team has to be the whole squad and some players really stepped up not only today, the whole year. The only thing I know is that we are going to keep on fighting. We cannot control injuries. I always say that for us, coaches, the hardest part of basketball is injuries. It is also difficult for players, but also for coaches. Of course, the game plan changes, that's for sure but it is something that we accepted very well. I am proud of the way my players are stepping up." "We needed to play together, as a team. I think that, in the first half, we didn't play really good defense, one-on-one defense. They were not doing anything special but made big shots. Madrid has a lot of quality players and as a team. We came out in the second half and played together on defense. We passed the ball more in the second half and showed our true character." "I believe in general we played a good game. It is true that, in the third quarter, they were much more aggressive than in the first half and in that sense, they returned to the game. We kept doing our job but in the end, due to small mistakes, and because of the atmosphere in here, we come back home with a loss. I am very satisfied with our character and how we planned a game like this. Sometimes the final push is given by your fans - we know that from our home games, too. They had that push tonight and we have to learn from our mistakes and avoid turnovers. We dominated the boards in the first half, but not in the second half. We know what we have to learn in order for this not to be repeated. In general, I think we played a very good game. They have a lot of talent but it is hard to give 100% for all 40 minutes. We have to be happy about our game and learn from those small mistakes that gave them the win."